CIMTEC Automation-An authorized Horner OCS distributor serving Virginia, North Carolina and South Carolina. 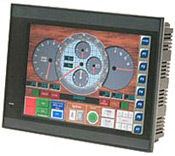 OCS is a robust, reliable control product that combines a traditional controller (programmed with ladder logic) with an operator interface, I/O and networking into an integrated, all-in-one-unit using a single industry-recognized software package called Cscape.™ Download Cscape™ for free here. Since 1998, Horner has led the way with the broadest selection and largest installed base of all-in-one-controllers. The XLe Operator Control Station (OCS), is Horner's lowest cost "all-in-one" controller and small enough to fit in the palm of your hand (only 3.75" square). For less than a micro PLC plus operator interface, the XLe includes a Graphical Operator Interface, Built-in I/O, Networking and Removable Mass Data Storage. NX Graphical OCS seriesThe NX Graphical OCS series is a low cost, high-performance all-in-one controller with embedded features such as Ethernet, High Speed Counter, CompactFLASH® and Web server. It uses Horner’s complete selection of snap-on and distributed I/O. Full Alarming Package, downloadable fonts and four selectable lanquages. QX Color-Touch OCS series The QX Color-Touch OCS series features a fast, powerful logic engine, SVGA resolution touchscreens and optional snap-on I/O. The QX has three screen sizes (8.4", 10.4", and 12.1") In addition, the QX has embedded Ethernet and supports many Internet capabilities such as remote data access, programming, hosting HTML-based Web pages, and FTP sites. 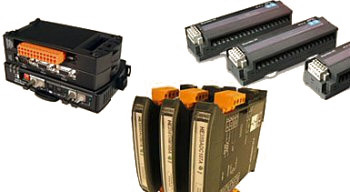 Horner APG offers a wide variety of I/O options for use with OCS. SmartStack™ I/O System are snapped onto the Operator Control Station (OCS) or an off- mounted base, and then stacked onto each other. Over 60 digital, analog, communication and specialty modules are available. SmartMod™ I/O, is a great choice for expanding OCS when you need one, two or a few more digital or analog I/O. SmartStix™ I/O is a terminal block style distributed I/O system for OCS. IC300ASC100 ASCII BASIC. Three ports, two active at any one time. 64K of program memory. IC300DAC202 8 channel Analog Outputs (4-20mA, 0-10vdc) ch-by-ch select. IC300DIM210 8 DC Inputs (12/24vdc, pos/neg logic). IC300DIM410 32 DC Inputs (12/24vdc, pos/neg logic). IC300MIX963 Temperature Controller I/O Board. 4 temperature inputs (RTD/Thermocouple) selectable ch-by-ch, 2 channels Analog Outputs, current (4-20mA), 2 Relay Outputs (250vac, 30vdc, 5.0A), 2 DC Outputs (5/12/24vdc, 0.5A neg logic with ESCP). IC300OCS035 OCS with 2x20 LCD Display and with 16-key tactical feel keypad. Built in I/O no expansion. One RS-232 serial port supporting CsCAN and RTU Master/Slave. 8 DC Inputs (12/24vdc), 6 Relay Outputs (3.0A per point).No network interface. 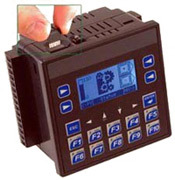 IC300OCS036 OCS with 2x20 LCD Display and with 16- keypad. Built in I/O no expansion. 8 AC Inputs (120vac), 8 AC Outputs (80-250vac 0.3A per point). No network interface. IC300OCS037 OCS with 2x20 LCD Display and with 16-key tactical feel keypad. Built in I/O no expansion. One RS-232 serial port supporting CsCAN and RTU Master/Slave. 8 AC Inputs (120vac), 6 Relay Outputs (3.0A per point). No network interface. IC300OCS052 OCS with 2x20 LCD Display and with 16-key tactpad. 8 DC Inputs (12/24vdc), 8 DC Outputs (5/12/24vdc, 0.5A pos. logic with ESCP) and 4 In/2 Out Analog, Voltage. No Network. IC300OCS053 OCS with 2x20 LCD Display and with 16-key tactpad. 8 DC Inputs (12/24vdc), 8 DC Outputs (5/12/24vdc, 0.5A pos. logic with ESCP) and 4 In/2 Out Analog, Current. No Network. IC300OCS061 OCS with 2x20 LCD Display and with 16 keypad. Built in I/O no expansion. 8 DC Inputs (12/24vdc), 8 DC Outputs (5/12/24vdc, 0.5A pos. logic with ESCP). Built-in network. IC300OCS063 OCS with 2x20 LCD Display and with 16-keypad. Built in I/O no expansion. High Speed Counter and PWM/PT. 8 DC Inputs (12/24vdc), 8 DC Outputs (5/12/24vdc, 0.5A pos. logic) With CAN network. IC300OCS065 OCS with 2x20 LCD Display and with 16- keypad. Built in I/O no expansion. 8 DC Inputs (12/24vdc), 6 Relay Outputs (3.0A per point). With CAN network interface. IC300OCS066 OCS with 2x20 LCD Display and with 16- keypad. Built in I/O no expansion. 8 AC Inputs (120vac), 8 AC Outputs (80-250vac 0.3A per point). With CAN network interface. IC300OCS067 OCS with 2x20 LCD Display and with 16- keypad. 8 AC Inputs (120vac), 6 Relay Outputs (3.0A per point). With CAN network interface. IC300OCS082 OCS with 2x20 LCD Display and with 16-key tactpad. 8 DC Inputs (12/24vdc), 8 DC Outputs (5/12/24vdc, 0.5A pos. logic with ESCP) and 4 In/2 Out Analog, Voltage. With CAN Network. IC300OCS083 OCS with 2x20 LCD Display and with 16-key tactpad. 8 DC Inputs (12/24vdc), 8 DC Outputs (5/12/24vdc, 0.5A pos. logic with ESCP) and 4 In/2 Out Analog, Current. With CAN Network. IC300OCS100 OCS with 2x20 LCD Display, and 17-key tactile feel keypad. Supports up to 4 SmartStack I/O Boards, full ladder instruction set and CsCAN Networking. IC300OCS110 OCS with 2x20 LCD Display, and 17-key tactile feel keypad. Supports up to 4 SmartStack I/O Boards, full ladder instruction set and CsCAN Networking. IC300OCS200 OCS with 4x20 LCD Display, and 32-key tactile feel keypad. Supports up to 4 SmartStack I/O Boards, full ladder instruction set, and CsCAN Networking. IC300OCS210 OCS with 4x20 LCD Display, and 32-key tactile feel keypad. Supports up to 4 SmartStack I/O Boards, full ladder instruction set, and CsCAN Networking. IC300OCS250 Graphical OCS Screen size 130 x 75 mm monochrome, (2) serial ports, (1) RS-232 and (1) RS-485/RS-232 port, (1) CAN port 3 meg of screen memory and 64K of logic. IC300OCS999 Demonstration Case. Includes OCS100, OCS200, and variety of SmartStack Hardware. IC300OSW232 Cscape programming software (CD ROM), RS-232 programming cable, and complete software/hardware documentation. IC300RCS061 8 DC Inputs (12/24vdc), 8 Positive Logic DC Outputs (5/12/24vdc, 0.5A with ESCP). Built-in network interface for CsCAN or DeviceNet slave. IC300RCS065 8 DC Inputs (12/24vdc), 6 Relay Outputs (4.0A per point). Built-in network interface of CsCAN or DeviceNet slave. IC300RCS075 14 DC Inputs (12/24vdc), 10 Relay Outputs (2.5A per point). Built-in network interface for CsCAN or DeviceNet slave. IC300RCS077 14 AC Inputs (120vac), 10 Relay Outputs (2.5A per point). Built-in network interface for CsCAN or DeviceNet slave. IC300RCS210 Remote Control Station (OCS without Keypad and display) Supports up to 4 SmartStack I/O Boards, full ladder instruction set, and CsCAN Networking. IC300TIU111 Operator Control Station, Two serial ports, (1) RS-232 and (1) RS-485/RS-232, (1) CAN port with keypad. No SmartStack or Control Support. IC300TIU201 Graphical Operator Control Station Two serial ports, (1) RS-232 and (1) RS-485/RS-232 port, (1) CAN port, 3 meg of screen memory. (4) SmartStack support. No controller support. IC320CGM562 PCI CsCAN Interface Board, 2 channel. Bundled with CsCAN OPC Server. IC693CDC200 Series 90-30 CsCAN interface module. One CsCAN port and one programming port for network devices. IC693CPU500 Series 90-30 Cscape CPU supports 1,024 I/O. The processor can be programmed the same as the OCS products over the built-in network that supports CsCAN or DeviceNet Slave. HE190IBSRMU Interbus-S RMU (Remote Message Unit) supporting MMICOM. HE300IBS100 Interbus-S interface board for AF300E$ drives. HE300SFW100 Drive configuration software for GEN100 and RSL100. HE660SER211 Genius sequential event recorder with 8 inputs (30-300VDC) with 1ms resolution, network synchronization, and IRIG-B. HE693ASC940 ASCII BASIC module for Series 90-30 with 32k EEPROM, 32k NVRAM, 2 RS-232 ports, 1 RS-485 port and a 14.4 kbaud modem. HE693BZL100 Mounting bezel for compact OIUs. HE693BZL300 Mounting bezel for full-sized OIUs. HE693DNT250 DeviceNet Scanner (master) module for Series 90-30. HE693DNT750 DeviceNet slave module for Series 90-30. HE693IBS100 Interbus-S slave module for Series 90-30. HE693IBS313 Interbus-S slave module for Series 90-30 autoconfiguring CPU313 rack. HE693IBS323 Interbus-S slave module for Series 90-30 with additional autoconfiguring CPU323 rack. HE693ISOBLK DIN rail mounted cold junction compensation block for thermocouple input modules. HE693PBS105 Profibus DP slave module for Series 90-30. HE693PIF104 PC Interface to Series 90-30 I/O in PC104 form factor. HE693PWR524 Power supply adapter for Series 90-30 to allow for redundant power supplies. HE693RLY100 8 point unfused relay module for Series 90-30, rated to 8A, 2 NO/NC, 6 NO. HE693RTD660 6 channel RTD input module for Series 90-30 with 700VDC bus-isolation and 0.05°C resolution. HE693RTD665 6 channel RTD input module for Series 90-30 with 700VDC bus-isolation, 0.05°C resolution and 50Hz filtering. HE693RTD666 6 channel RTD input module for Series 90-30 with 700VDC bus-isolation, 0.05°C resolution and 60Hz filtering. HE693RTM705 RTU / Modbus master module for Series 90-30 with 1 RS-232 port, 1 RS-485 port, supports Report by Exception. HE693RTU940 RTU / Modbus slave module for Series 90-30 with 1 RS-232 port, 1 RS-485 port, and a 14.4 kbaud modem, supports Report by Exception. HE693SNP900 SNP slave module for Series 90-30 with 1 RS-232 port and 1 RS-485 port. HE693SNP940 SNP slave module for Series 90-30 with 1 RS-232 port, 1 RS-485 port and a 14.4 kbaud modem. HE693STG883 8 channel +/-20mV, +/-25mV, +/-30mV strain gage input module for Series 90-30 with 16-bit resolution and weighing functions. HE693STG884 8-ch. +/-25mV, +/-50mV, +/-100mV with 16-bit resolution + weighing func. HE693STP113 One axis stepper positioning module for Series 90-30 with incremental encoder feedback, optical isolation, independent acceleration/deceleration and indexed moves. HE693THM665 6 channel thermocouple input module for Series 90-30 with 0.1°C resolution, bus/channel isolation and 50Hz filtering. HE693THM666 6 channel thermocouple input module for Series 90-30 with 0.1°C resolution, bus/channel isolation and 60Hz filtering. HE693THM668 6 channel thermocouple input module for Series 90-30 with 0.1°C resolution and bus/channel isolation. HE697THM260 8 channel thermocouple input module for Series 90-70 with 0.1°C resolution and resistance measurement. HE700GEN100 Single channel Genius interface module for VME. HE700GEN200 Dual-channel Genius interface module for VME. HE800ACC006 Cage-clamp (screw) style I/O plug, 6-terminal. (Qty 1). May be used as an alternative to the standard SmartStack plugs which are spring-clamp style. HE800ACC512 DIN-rail mount Terminal Block, 12-pin. Compatible with most SmartStack Analog I/O. HE800ACC519 DIN-rail mount Terminal Block, 19-pin. Compatible with most SmartStack Digital I/O. Allows SmartStack I/O to be terminated on panel backplate as an alternative to direct SmartStack termination on panel door. HE800DST935 Distribution Adapter for DIQ935. Connects to DIQ935, converting high density D-sub connections to IDC style connections. Provides 4 26-pin IDC connections, each connection supporting 16 inputs or 16 outputs.